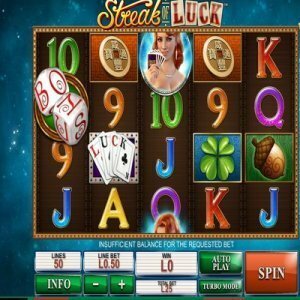 [miau] The Streak of Luck Slot machine is an engaging and brightly colored slots game that employs several features to keep it fresh and entertaining. Wins can be achieved in this game in one of several ways. There are, of course, the normal matching items on bars staple of the slots game. It is a set fifty bar game that offers four types of symbol. There are rainbow colored numbers and letters and there are pictures of lucky items. There are a wild placeholder and dice as bonus. The matches are enhanced by a bonus bar which guarantees free spins after a five win streak. The longer your lucky streak the more free spins you win until reaching a jackpot sum. The dice symbol leads to a mini game when three or more appear on the screen at the end of a spin. The game pulls up a virtual dice table where the player can make rolls. Higher scores allows the player more rolls. The rolls in the mini game generate bonus winnings to be added to the total score. As far as winning goes, however the Streak of Luck is a pretty good example of the general casino rule that the house always wins. Wile the game play is fun and the colors and pictures keep a player’s attention it seems rather difficult to get ahead in the game. After a while, although it lets you make enough to play for some time, you begin to see a dramatic decrease in your playable funds. When playing for fun this is not too bad of a thing, it could amount in some serious losses if playing for real money. That, however, is the nature of slots anyway and so it does not take away from the enjoyment and playability of the game too much. Overall it is a good game. The play goes on long enough to have some fun but for so long that it will end up consuming a whole day and that is a good thing. While it is not something recommendable to someone who is looking to turn a profit or sore losers, it is fun. The Streak of Luck slot machine could prove to be a great way to chase off boredom for a while when there is nothing better going on. It is fun and colorful and one of the better choices for a slots game.